The next stop on my Alaskan journey was Juneau, Alaska – the capital of the state with a population of 33,000, 55 miles of road, and a tidal range of 25 ft/day. I started the day on a small boat that zipped off to Coghlan Island to pull a crab pot to see if any European Green Crab were caught. The European Green Crab (Carcinus maenas, information and fact sheet) is an invasive species from the North Atlantic Ocean that came over to this region in the ballast water of ships. To date, this crab has only been documented in waters as far north as upper British Columbia. Alaskans are strongly concerned about the appearance of the European Green Crab, as it will out-compete the Dungeness Crab, which is so important to the local economy. Alas, all we saw in the crab pot was a Widehand Hermit Crab. 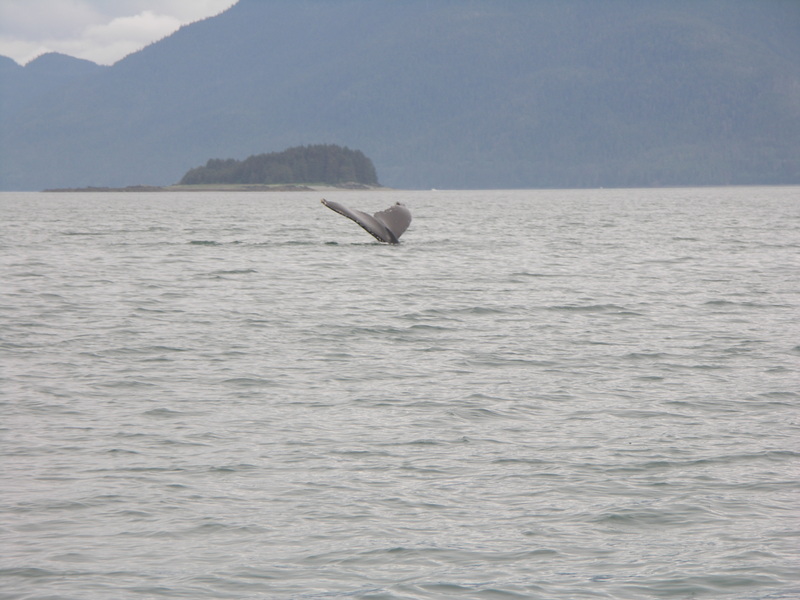 After also spending some time looking at humpback whale tails for identification of individuals (no two have the same pattern on the underside of their tail), it was back to land and off to see one very important glacier. 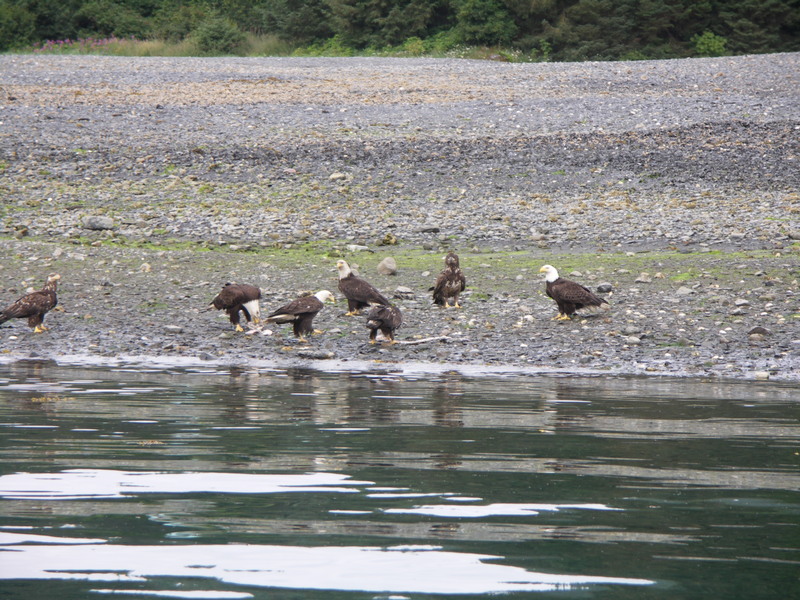 Collection of eagles having a feast! 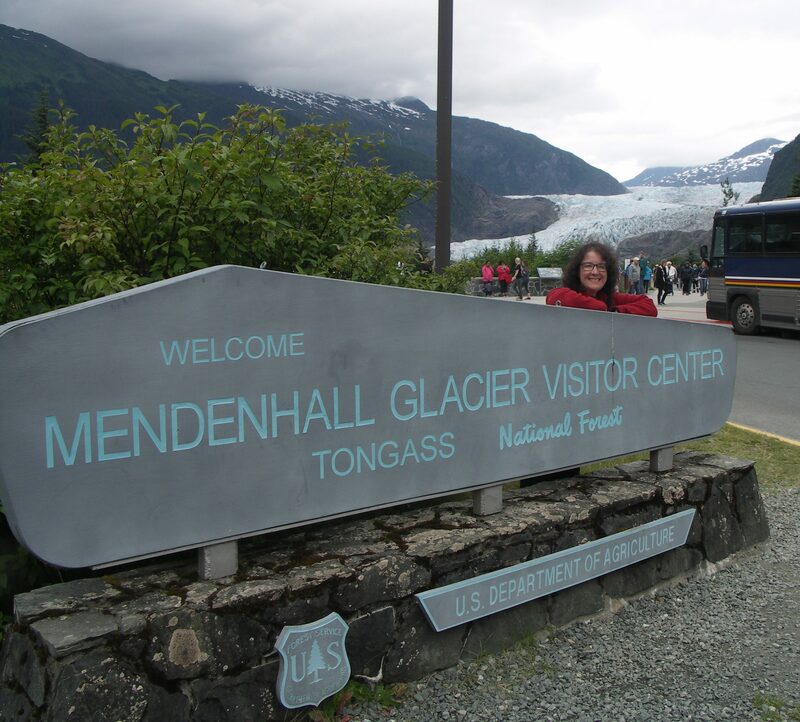 In Tongass National Forest, Mendenhall Glacier is well known to geologists, with images of this dynamic glacier appearing in textbooks and on websites (this blog post by Mauri Pelto will give you some more on the “science” of the changing glacier over time). The Visitor Center is the start of many trails of exploration, including a walk over to Nugget Falls, shown in the photo slideshow below. Mendenhall Glacier reached its greatest extent in the late 1700’s and has been retreating ever since, with the rate of retreat increasing in recent years. In 2014, it was reported that the glacier shrank by 540 feet and will no longer be visible in roughly another 40 years. Icebergs periodically calve off the glacier and float across Mendenhall Lake (I have some photos of these icebergs, too!). Here are some of the other views of the Mendenhall Glacier section of Tongass National Forest. The ecology and wildlife in this National Forest are also spectacular, as well as the glacial features, such as striations, on the smooth surfaces of the bedrock. If you get a chance to visit, leave yourself plenty of time to explore the trails and scenery (and have your digital camera fully charged – you’ll find yourself stopping every few feet and snapping photos! ).